If you would like a healthy, beautiful smile that lasts a lifetime, the team at Carolina Dental Arts is here to help you achieve this goal. Alongside our general dentistry treatments, one of the most important ways to accomplish this is dental home care in Raleigh, Goldsboro and throughout North Carolina. Along with eating balanced meals and reducing unhealthy snacks, correctly using dental tools helps control the plaque and bacteria that causes dental disease. 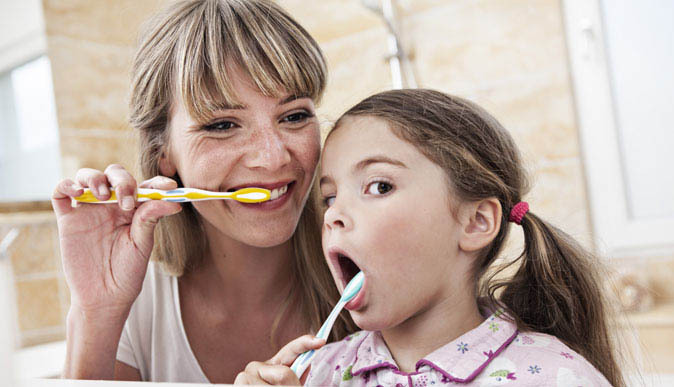 Below, we have listed a few dental care tips that you can use at home. First, place the brush at a 45 degree angle at the gums and gently brush in a small, circular motion. Make sure that you always feel the bristles on the gums. Brush the outer, inner and biting surfaces of each tooth, and use the tip of the brush to clean the inside of your front teeth. Lastly, brush your tongue to remove bacteria and freshen your breath. Electric toothbrushes are also beneficial, as they are easy to use and thoroughly remove plaque. Simply place the bristles on your gum and allow the brush to clean your teeth. Take 12 to 16 inches of dental floss and wrap it around your first fingers and hold in place with your thumbs, leaving about 2 inches of floss between your hands. Use your thumbs and forefingers to guide the floss as you insert in between the teeth using a sawing motion. Curve the floss into a “C” shape around each tooth and under the gumline. Gently move the floss up and down, as this cleans the side of each tooth. If you have trouble using conventional floss, try floss holders for easy cleaning. After brushing and flossing, and after a meal if you can’t brush, rinse your mouth out with water. Consult with your dentist or dental hygienist to see if using an over-the-counter mouth rinse or other dental hygiene tools, such as interdental brushes, rubber tip stimulators, tongue cleaners, irrigation devices, fluoride or medicated rinses, is right for you. The team at Carolina Dental Arts would be happy to help you create a dental hygiene routine that aids you in your success toward at home dental care in NC. Talk with us at your next appointment or contact us today with your questions. Carolina Dental Arts offers exceptional dental procedures in North Carolina at our locations across the state, including Falls Of Neuse, Glenwood South, Goldsboro and New Bern Ave.
"Filling cavities is never fun, but Dr. Allen made me feel as comfortable as possible. The staff is very friendly, and I think Dr. Allen is great." My experience here was PAINFUL... but necessary. Very professional. Very informative. Inviting & helpful.